“That’s not right, and it’s not going to happen as long as I’m president,” he pledged, earning rare applause from his mostly silent audience at George Washington University. All of this is aimed at reducing our national debt (not to be confused with last week's debate over the annual deficit) by $4 Trillion dollars over the next 10 years. In case you were wondering, the national debt currently stands at about $14 Trillion dollars. One of the MAJOR disagreements between President Obama's plan and the Republican plan presented by Congressman Paul Ryan last week is over Medicare for Seniors. The Republican plan seeks to lower government spending by privatizing Medicare in 2022, thereby removing it from the federal budget completely. Obama made clear in yesterday's speech that he would not allow that to happen. The CBO estimates that under the current Medicare plan, what the average Seniors pays on their medical costs is about 25% of the total; under the Republican privitization plan, Seniors would have to pay 68% of those same costs. In other words, Senior's medical costs would go up substantially. Another MAJOR disagreement is over Social Security, which, again, the Republicans want to privatize. We have blogged about the Privatization of Social Security in depth HERE, so feel free to reference that discussion as needed. The last MAJOR disagreement, as we mentioned above, tax cuts for the rich. As you may recall, Obama agreed to extend the Bush Tax cuts last December. The Republican plan presented by Ryan continues the tax cuts for the rich, whereas Obama made clear in his speech that he plans to return the tax rate on the rich (those making more than $250k/yr) to what it was under President Clinton (38%). 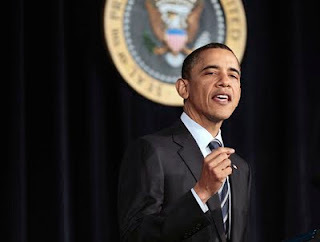 Whether you agree or disagree with the Presdient, the one thing that his speech has done is set the stage for what many expect will be THE 2012 campaign debate going forward for the rest of the year: entitlement spending. Obama knows that if he can work out a deal with the Republicans this year on Medicare, Medicaid and/or Social Security over the next several months, then the majority of the public who favor and/or depend on these programs will give him props for saving entitlements. If, on the other hand, the Republicans refuse to budge (what are the odds of that happening? ), then this debate will drag on until 2012 with the President standing on the side of the people and the Republicans standing on the side of the Government who wants to end their entitlements. What did you make of the President's speech? Who has the better budget plan - the GOP or the President? Do we need to privatize entitlement spending? Will the Republicans work out a long-term deal with the President before the 2012 election? Will Obama deliver on the details this time or will he leave it up to Democrats in Congress?